What Software Do I Need To Use The Patches? Each patch includes a "Software Required" section at the bottom of the patch description. We use MainStage 3 as the host program for all of our patches. Every patch available in the patch store will use MainStage 3. Updating to the most recent version of MainStage will ensure that you will be able to open our MainStage Concerts. Omnisphere is our core synth plugin. Almost all of our synths, pads, pulses, and leads were created using Omnisphere 2. With the complexity of keyboard sounds that are being used today in worship music, Omnisphere allows us to fully recreate the exact sounds used on your favorite albums. Updating to the most recent version of Omnisphere 2 will ensure that the patches will load correctly. This plugin is our primary piano plugin. We use it to create a variety of pianos such as huge full piano sounding pianos, and softer more delicate piano tones. The Kontakt 5 Player is required to run The Giant. 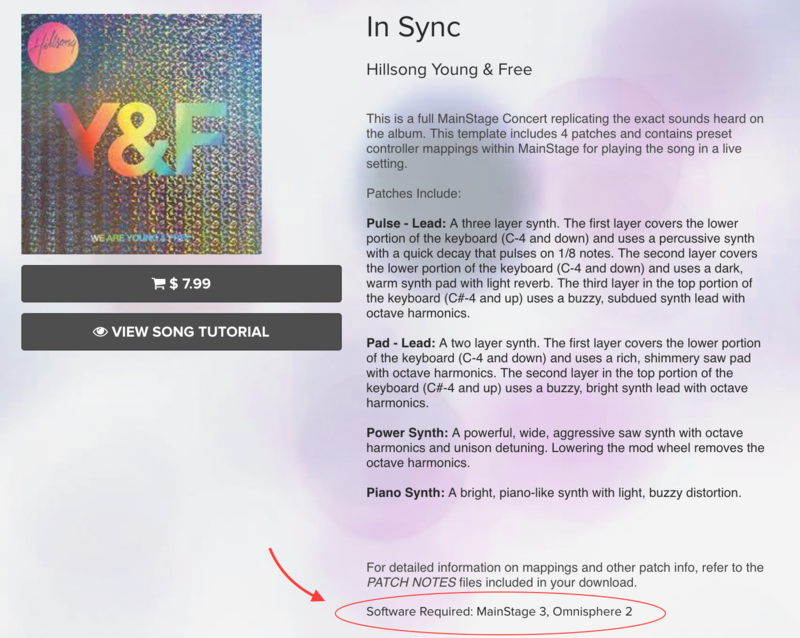 This plugin is only used in a couple Worship Online Patches. It is a fantastic organ that replicates the very popular Hammond B3 used in many worship albums. The Kontakt 5 Player is required to run Vintage Organs. This plugin is only used in a couple Worship Online Patches. It has a variety of electric piano sounds and makes a great substitute for a song that needs a Rhodes piano. The Kontakt 5 Player is required to run Scarbee Vintage Keys. This plugin is our primary reverb effect. We use this on any patch that uses The Giant. It is very versatile, giving smooth, ambient reverbs or brilliant, crisp reverbs. Click here for a list of keyboard gear required to use the Worship Online Patches.